Sal Salvador will probably be best remembered for his work with the Stan Kenton Orchestra in the early Fifties but after leaving Kenton he had a great deal of success with his own quartet and he was regularly on call for free-lance studio work. He was always searching for new avenues to display his talents and his Colous in Sound Orchestra was born and he recorded three albums with the orchestra for Bethlehem Records from 1958 to 1963. The numbers recorded on the three albums were a mixture of original material and numbers from the standard songbook. All three albums are contained on this double CD release plus two tracks recorded for a single release on the Danbar label. There are four arrangers providing the arrangements over the three albums including Sal Salvador himself but it is George Roumanis who is the bass player on the first album “Colors in Sound” who was instrumental in encouraging Sal Salvador to get the band together and provided all the arrangements for the album. Although it is an all brass orchestra the light and shade in the arrangements is provided by the use of the French horn, tuba and mellophone which sets it apart from other orchestras of the period. The main soloists on this album are Sal Salvador, Bill Barber and Ray Starling but is the leader Sal Salvador who provides the bulk of the solos. It is surprising how little you miss the lack of reed instruments but the arrangements are blended to make full use of the guitar and particularly on the slower numbers where the various instruments are blended together to create a lush sound. It is the standard tunes which stand out like “For You, For Me, For Evermore”, “Easy Living” and “You Brought a New Kind of Love to Me” which stand out as the way they are arranged bring a new freshness to them. For the second album “ The Beat For This Generation” an alto saxophone and two Tenor Saxophone plus a baritone are added to the ensemble. The bulk of the arrangements are provided by Larry Wilcox and Hank Levy and there is a slightly different feel to the band, if anything it sounds slightly more brassy. There are two beautiful arrangements by Larry Wilcox of “But Beautiful” and “I’m Glad There is You” which are features for Sal Salvador’s guitar. There is a storming arrangement of Larry Wilcox’s own “Venice Anyone” which features some exciting exchanges between the saxes. discounted and add nothing to the success of the album. 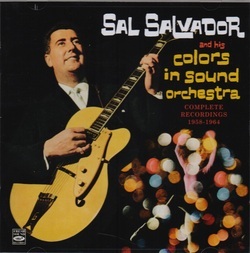 A Larry Wilcox original “Shade Three” is a lovely feature for Sal Salvador and the Sal Salvador composition “Colors in Sound” is a beauty which gives full reign to the band’s potential. I found this release ful of surprises and can’t praise to highly it is a band with a difference and is recommended to all lovers of big band music.